Spec-fic (n.) - An abbreviated slang form of speculative fiction, which is itself an umbrella term for science-fiction, fantasy, and horror fiction, as well as the various subgenres contained in, and shared by, each. It's also a very loaded term in nerd circles. Some see spec-fic as the parent category of all truly imaginative literature, encompassing any setting, plot or character that includes or involves objects, events, or effects not found in the conventional world. Thus, Hamlet -- what with its prominent inclusion of a ghost-king -- would qualify as spec-fic under this usage, which for some is the problem. The counterpoint to the broad, almost aspirational definition of spec-fic is the what might be called the geek brand of spec-fic, wherein the term is used to classify works that don't neatly fit into one classic genre or subgenre. For example, Harry Turtledove's Guns of the South posits what would happen if time-travelers gave modern weapons to the Confederacy during the U.S. Civil War. This is quite obviously a sci-fi tale, as the time travel points out, but the novel also focuses on clear historical events and consequences, making it very much an alternate history tale. Spec-fic is a term that bridges the gap between the genre divisions that fandom (and book marketers) often use to segregate nerd-worthy literature. I bring it up because: Today is author Cherie Priest's birthday, and her career is a fantastic example of the straddling of (false) genre divisions that fans love and expect (and drives book marketers a little nuts). Her debut novel, Four and Twenty Blackbirds, is a southern gothic, modern fantasy, and horror tale. Her most recently released novel, Fathom, is a combination historical fiction, southern gothic, mythpunk-slash-Chthulhu-slash-pirate tale. Priest's upcoming novel, Boneshaker, is set in her new Clockwork Century universe, which crosses alt-history Civil War fiction with steampunk, Weird West, horror, and maybe a little sci-fi for fun. And if you think Priest's bibliography is a tad difficult to classify, try China Mieville on for size. I think his Perdido Street Station has about 57 genres and subgenres contained within it, and that's before you even get to the poetic, murderous, reality warping spider-god (who is a side character, mind you). You might also enjoy Charles Stross's Jennifer Morgue, which is a postcyberpunk-Chthulhu-spy-fi meta-satire. With a heroic mermaid succubus as the female lead. Lots of that doesn't show up on the cover blurb, as you might imagine. Thus we have yet another reason I wish my local bookstore (and my new favorite online bookstore) would have multiple overlapping genre categories -- because spec-fic is too broad a term for most of what I love, and lots of the books I read fall into so many subgenres that they defy description, but certainly not enjoyment. Astrochicken (n.) - A hypothetical biomechanical space probe that is both self-maintaining and self-propagating. More specifically, a thought experiment from Freeman Dyson, a physicist perhaps best known for conjuring up the insane sun-swallowing megastructures known as Dyson Spheres. Basically, an astrochicken is a cyborg Von Neumann probe, a mashup of genetically engineered biological parts melded with mechanical components that can create an exact copy of itself mutltiple times after launch. The biological component is what separates the astrochicken from other self-replicating probe concepts, as it would be self-nourishing and self-healing, much like most living creatures, and it would create offspring space probes during its lifetime. If fully functional, the population of astrochickens would increase exponentially, returning to Earth an ever-increasing volume of data about the universe. As is true of most of Dyson's theoretical concepts, teh astrochicken bridges multiple concepts is intended to be subversive, challenging entrenched notions of how to conduct space exploration and scientific progress. I bring it up because: Tomorrow is the start of the 2009 San Diego Comic-Con, which is perhaps the best example of a self-replicating techno-organic mashup that pushes the limits of known physics. Trust me, there are living things that appear at SDCC that no scientist is equipped to classify, and you'll usually find them ogling booth babes or audibly debating whether or not Batman should be a member of the Black Lantern Corps. And I say that is both a devout comics fanboy and former SDCC attendee. I'd gladly attend SDCC if I could, but I'd also keep a taser handy to ward off the husky mouthbreather in the Captain America t-shirt and sweatpants who won't stop humming the Dr. Horrible theme and stalking Felicia Day. Nothing we find on an extrasolar planet could be scarier than that. Lofstrom loop (n.) - An enormous man-made magnetic track designed to launch payloads into orbit without the use of conventional rockets or propulsion systems. And by enormous, we mean puts-some-mountain-ranges-to-shame gigantic, with oft-cited estimates of a Loftsrom loop's necessary dimensions placed at 2000 kilometers long and 80 kilometers high. Some weather systems could pass cleanly underneath a Loftsrom loop. These structures are also known more simply as launch loops, but are often identified with electrical engineer Keith Lofstrom, who fleshed out the physics behind this pharaohic rocket-replacement system. A Lofstrom loop works by magnetically rotating a belt along its entire length, sort of like a hybrid between the checkout line out the supermarket and a Japanese bullet train. The motion of the belt is what keeps the loop aloft in near-orbital space, since there's no way to build a self-supporting 80 km-high structure with known materials. Ironically, a Loftsrom loop is a simpler and cheaper alternative to the more popularly known space elevator, as the loop doesn't require placing any part of its structure in space, and doesn't (theoretically) require any knew materials for its construction -- just insane, science-fictional boatloads of money, and a constant 200 megawatt power source that never, ever stops. Oh, and you have to build it over the ocean because the loop's collective inertia rivals that of a small nuclear weapon's force output, so a cable break could theoretically wipe a small city off the map if you built it over a residential...er...continent. I bring it up because: Today is the 40th anniversary of the launch of Apollo 11. On July 16, 1969, one of only 13 Saturn V rockets ever built hurled into space the first manned mission to the surface of the moon. It cost over $45 billion in today's money to design and build the fleet of Saturn Vs, and 40 years later, we still don't have any better vehicle than the massive controlled-explosion skyskrapers we call rockets to put payloads into space. Oh, and that "next generation" launch program called "Apollo on steroids" that will produce the Ares V rocket and the Orion/Altair vehicle fleet? Charles Stross rightly points out that the kind of NASA that could build that rocket is long gone, so the next great rocket will never be built. If we're going to get back into space in a serious, manned-expedition way, it's going to take a radical new technology, and maybe even a loopy one. RKV (n.) - An accepted abbreviation for relativistic kill vehicle, a weapon that moves at near-light speeds in order to inflict maximum impact damage on its target. Also sometimes called a relativistic bomb, an RKV is a kinetic energy weapon taken to its logical extreme, combining the principles of Newtonian and Einsteinian physics. Newton's second law holds that force equals mass multiplied by rate of acceleration. Thus, even a small mass moving at sufficient acceleration can generate significant force. "Conventional" kinetic weapons apply this law by simply dropping large, inert masses from planetary orbit (like the tungsten rods dropped from satellites in Warren Ellis's Global Frequency), allowing gravity to accelerate the payload to destructive velocity. RKVs go one step further, using vast interstellar distances to accelerate kinetic warheads to near-light speed, multiplying the force of their impact to catastrophic -- even planet-killing -- extremes. RKVs are often a favorite plot device for hard sci-fi authors, including Larry Niven in his Known Space series, Charles Stross in Iron Sunrise, Joe Haldeman in The Forever War, and Vernor Vinge in A Fire Upon the Deep. RKVs don't require that civilizations develop faster-than-light travel or communication, as even subluminal propulsion systems can accelerate weapons to relativistic speeds given enough time and distance. Thus, wars fought between planets and stars are an ideal theater of conflict for RKVs, especially if you don't have FTL sensors to see them coming. I bring it up because: Today is the 54th anniversary of Russell-Einstein Manifesto. 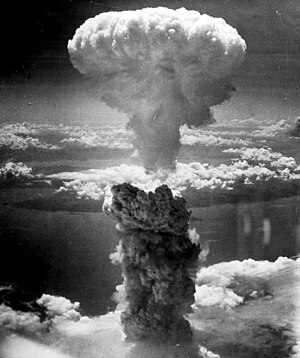 On July 9, 1955, Albert Einstein, Bertrand Russell, and nine other noted intellectuals signed an essay highlighting the unconscionable dangers posed by nuclear weapons and implored world leaders to seek other, non-atomic-armageddon means of guaranteeing security and resolving conflict. Many view the manifesto as Einstein's repudiation of the application of his scientific breakthroughs to martial purposes. Unfortunately for Uncle Al, science has always led the way to new and more efficient weapons. Even setting aside the fission/fusion applications of Einstein's theories, his work on relativity can be applied for mass destruction in numerous ways, including the often overlooked brute-force example of RKVs. Food for thought, and some great science fiction. While I was on vacation a couple of weeks ago, I was the recipient of one of the most professionally handled and forward-thinking social media outreach efforts I've yet come across, and considering that I've done social media for a living on more than a few occasions, that's saying something. Even more impressive, the outreach didn't involve LinkedIn, Twitter, Facebook, MySpace or any other buzzword standard-bearer of the overhyped social Web. The outreach effort was from Tor books (the sci-fi imprint under Macmillan) in relation to their online bookstore. You read that right: A dead-tree book publisher most definitely has a clue of how to play in the digital sandbox, as I'll explain below. The entire communication took place over e-mail, with nary a tweet or friend feed in sight. I know what you're thinking: Where was the social media? As Chris Brogan and my colleagues at Social Media Explorer (Jason Falls and David Finch in particular) continue to preach but no one seems to hear, social media is about the connections, not the tools. Twitter is a means, not an end, and the Tor group was much better served in reaching their goals through old-school e-mail than overly asynchronous tweetspeak or Wall-to-Wall missives. What goal, you may ask? Getting an insanely insignificant blogger to give a damn about the new Tor book store. In other words, they wanted me to know about Tor's new project, and went through no minor effort to inform me. It is no false modesty to say that I am the smallest of small potatoes in the blogosphere. I no longer have my still-not-giant Geekend megaphone, and even my appearances on TechTalk and my tweet exchanges with some moderately well known names in sci-fi and comics don't crank my annual unique visitor levels into the four-figures-a-month range. I'm nobody, and I only barely know a few somebodies, all of whom Tor could much more effectively speak to directly. Using me to ping Mary Robinette Kowal, Lar de Souza or David Gallaher is a pointless effort. Tor has or easily could get all their phone numbers, and they'd all be happy to take the call. So why waste time with me? Because there is nobody too small in social media. One of my Nerd Words columns made the weekly roundup on Tor's own sci-fi blog, and that was all the validation the digital marketing team at Macmillan needed to consider me worthy of courting as a press source. In the land of Google, every incoming link is worth chasing, and Tor put no small effort into getting some links from little old me. Not that they ever asked for any link love, mind you. Macmillan's digital marketing manager, Ami, wrote a very brief and straightforward initial e-mail (and the only way to get the address she used would be to read all the way through my bio post) which linked to the new store and the press release covering its launch. Totally professional, but friendly and with enough personalized content to prove she knew who I was and demonstrate this wasn't a blind e-mail blast. Top marks so far, but nothing that out of the ordinary, right? At no point did Ami ask me to buy anything, pimp anything, or link anything. It was a simple "thought you'd like to know" mail, like she was mailing the New York Times and not Mr. Bloggy McSmallTime, along with a promise to answer any questions I had. Oh, and the pitch? Tor was launching a sci-fi/fantasy-only online bookstore that carried books from every major publisher, not just Tor/Macmillan. They were selling their competitors stuff side-by-sdie with their own. The boldness of the idea was intriguing, and worthy of its own (future) post. Naturally, the idea of someone taking on Amazon in the book space when B&N, Borders and Books-a-Million are hemorraging cash intrigued me. I'm a sci-fi geek, aspiring author, and once-and-future Web entrepreneur. 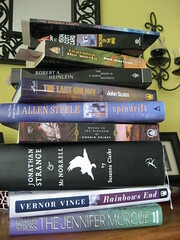 Books plus Web plus sci-fi was right in my wheelhouse. So I asked Ami a lot of follow-ups, with lots of gotcha specifics. She answered the same day -- by looping in the store's project manager who would speak to me directly about the site. Pablo got back to me the next day -- asking me to elaborate my questions -- and he answered them a couple days later with some very thorough responses. He then invited me to ping him again, directly, if I had any future questions. So, to recap, a major book publisher reaches out to a smalltime nobody with a press release about a bold new Web initiative -- with a personal invite, no less -- and then kicks him higher up the chain when he has questions. At no point do they ask for press, cross-linking, or even a simple purchase. There is no quid pro quo. Everything is professional and pitch-perfect. Oh, and they had to do some research to contact me. No direct, immediate or large payoff, just online community goodwill and knowledge dissemination. That's how you do social media outreach, boys and girls. And for what it's worth, it worked. From now on, my Nerd Words column will link to store.tor.com instead of Amazon for my book citations, which is a big deal for me, since I'm an Amazon Associate. I'm leaving (a very little) money on the table because the PR efforts impressed me so. The store is pretty good, too, but we'll discuss that later. Social media is about socialization, not the media. Remember this and you will succeed. Here endeth the lesson. Discuss. Megacorp (n.) - A business entity that has achieved such a far-reaching level of vertical and horizontal integration that its power rivals that of entire nations, often to the extent of fielding its own military force and enacting its own laws. William Gibson gets credit for coining the parent term megacoporation within his Sprawl Trilogy (which actually includes three novels, Neuromancer, Count Zero and Mona Lisa Overdrive, and three short stories, "Burning Chrome," "Johnny Mnemonic" and "New Rose Hotel"). The idea of a superpowerful corporation predates Gibson, of course, with such companies appearing as early as Robert A. Heinlein's Citizen of the Galaxy and Robert Asprin's The Cold Cash War. The megacorp idea continues to reap fertile returns in contemporary science fiction, including the omninationals from Kim Stanley Robinson's Mars Trilogy, the burbclaves of Neal Stephenson's Snow Crash, the planet-spanning corporatocracies of Charles Stross's Glasshouse, the ubiquitous Blue Sun from Joss Whedon's Serenity/Firefly universe, and in the government-supplanting megacorp Buy 'N Large from Disney/Pixar's WALL-E. Megacorps are almost always evil, and almost always at odds with the story's protagonist. Capitalism rarely gets a loving nod from sci-fi authors, even in the pro-software-corporation world of David Louis Edelman's Infoquake and Multireal. I bring it up because: A mere 47 years ago today, the quintessential real-life megacorp was born. Wal-Mart opened its first location in Rogers, Arkansas on July 2, 1962. Wal-mart has neither a standing army nor its own government (yet), but it does wield such remarkable market influence that it inspired the aforementioned Buy 'N Large. This is ironic because the creator of the Buy 'N Large concept, Disney, is itself a much more cogent example of a megacorp, with its staggering multinational diversification and and extraordinary level of legal autonomy within the confines of its Disney World resort outside Orlando, FL. Only Disney employees can own land within Disney World's boundaries, and Disney sets the building codes, establishes utility standards, runs the fire department, and can exercise eminent domain within those borders. And you thought the line for Space Mountain was scary.